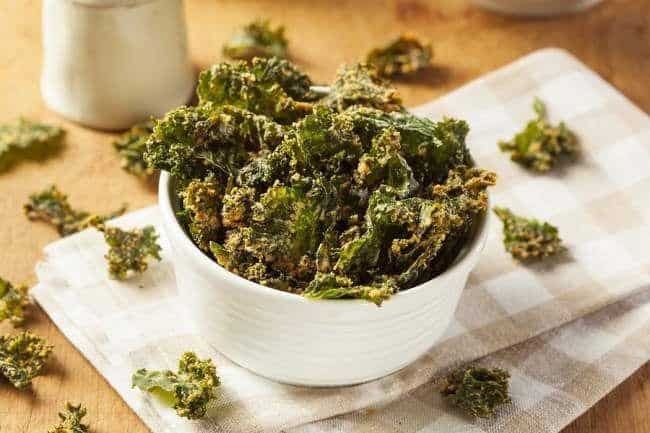 Kale sounds like an exotic brown beer brewed in the south of France or an ailment one picks up from one too many mosquito bites. Nothing could be further from reality. 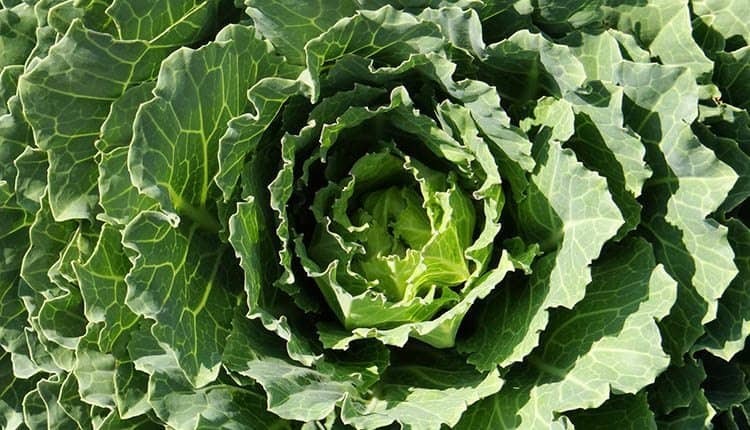 Of all the superfoods we could eat, this leafy green from the cabbage family is nutrient loaded. Not only does it have endless health benefits; kale is easy to prepare in under 5 minutes. But you may be asking yourself how do you cook kale or what are the health benefits of kale. We’ll kill two birds with one stone and answer both questions. Kale is a leafy green vegetable that stems from the same wild cabbage family as broccoli, cauliflower and collards. Unlike the aformentioned three, kale doesn’t quite get its fair share of the spotlight as it should. Why is anyone’s guess, because the health benefits of kale are overwhelmingly positive. And kale’s easy to prepare nature makes for simple meal-planning. 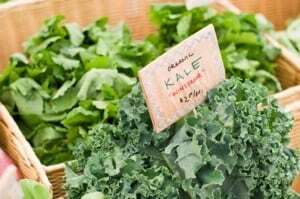 In fact, kale is rich in phytonutrients, low in calories and is one of the few vegetables that packs more health benefits per serving than even some standard run of the mill store-bought multivitamins. By contrast however, it isn’t going to make many friends on account of its odor. It has something of a rich pungent odor that distinguishes it from the rest of the dark leafy green vegetable community. Taste wise, it is almost spicy like pepper and has a rich taste. Kale has 3 fundamental incarnations: curly, ornamental and dinosaur. Curly is known for its ruffled leaves and deep green hue. 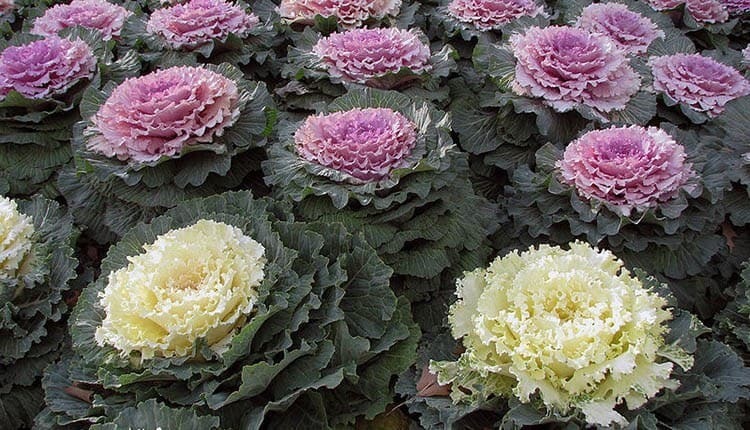 Ornamental kale has typically white, green or purple leaves with a more subdued flavor than curly’s pungent one. And lastly dinosaur kale or Tuscan kale tends to have dark blue-green leaves with a sweeter taste than curly kale. Kale can be found in the marketplace year round but is in season from winter to spring. That makes it an excellent choice for shoppers at their local farmer’s market where other food options aren’t available during the winter months. Kale nutritional benefits make it a strong choice to stock up the refrigerator during flu season and pack into salads during picnic time. It’s a versatile choice no matter what season of the year it may be. Just how do you cook kale? Actually cooking kale is much easier than one would think. First make sure you wash the kale thoroughly and avoid any cross-contamination in your kitchen when washing the kale. Contaminants from the grocery bag or from soil from the farmer’s market may be present. So it’s wise to use a vegetable wash and to be certain that when you wash the kale it is all cleaned in one central location. Then cut the leaves into 1/2 inch slices and the stems into 1/4 inch lengths. Let them sit for 5 minutes after they have been cut and washed. Then steam simply for 5 minutes. And presto, your kale is ready. Kale nutritional benefits don’t lose their integrity when being steamed. In fact kale retains all the potency of its many phytonutrients when being steamed just as if plucked raw from the earth. What are these health and nutritional benefits of kale we’ve been wildly raving about? Here are 12 to pique your interest. The body is a wondrous machine we subject to stress every moment we breathe. In fact antioxidants are one of the major sources of regenerative therapy naturally at our body’s disposal. If we don’t consume enough food sources with antioxidants our metabolism weathers what is called oxidative stress, leaving us at greater risk to cancer and other maladies we’ll get into later. Enter kale. Rich in powerful antioxidants that don’t lose their potency when prepared, kale is rich in two forms of antioxidants; flavonoids and carotenoids. Both raise blood levels to ward off cancer risks. 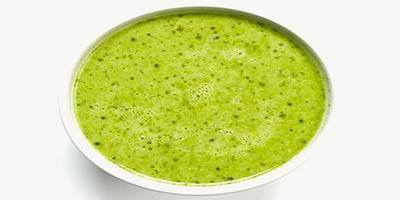 Lutein and beta carotene specifically are key nutrients in our bodies’ fight against cancer, pulmonary disease, cataracts, and atherosclerosis. 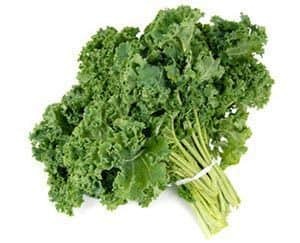 There are 45 different powerful flavonoids including kaempferol and quercetin found in kale. Not only are such antioxidants great cancer fighting agents, they are equally great anti-aging ones. Antioxidants help give the skin a healthy glow and youthful elasticity that seem to elude us as we age. Kale’s potent combination of anti-inflammatory, antioxidant, and phytonutrients makes for a strong weapon in preventing or lowering one’s risk of cancer, such as breast, colon or prostate. 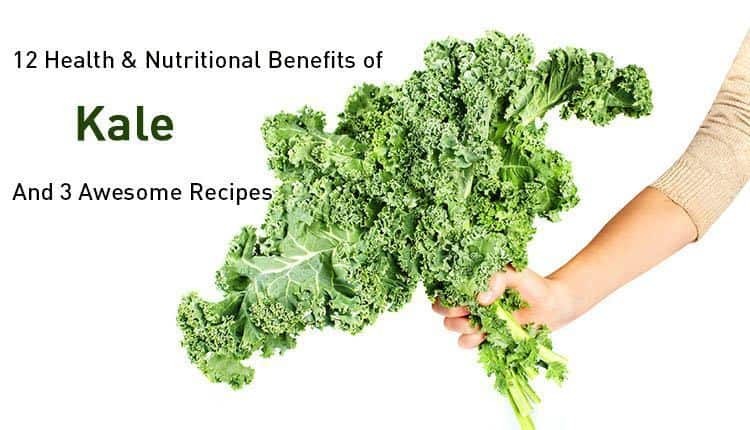 The health benefits of kale never cease to amaze researchers as much of these findings are still relatively new. Kale is a huge source of glucosinolates or what are commonly referred to as thioethers in chemistry (organic sulfur compounds). These nutrients are thought to fight carcinogens in the body when ingested. What food sources might we find these fighters of cancer-causing agents? We find glucosinolates in plants like kale. In fact kale is a strong source for at least 5: I3C, SFN, PEITC, BITC, and AITC; all of which attack carcinogens when digested. Glucosinolates work with flavonoids and Vitamin C to rid the body of toxins and free radicals that otherwise disturb the natural balance of things in our bloodstream. When kale is steamed fiber-related components bind with the bile acids in the body’s digestive system. The bile acids are then more easily and readily excreted. What happens next? The toxins are flushed from our bodies, our blood circulatory system seems to run much more efficiently and our cholesterol begins to drop into the healthy ranges. In essence, kale possesses a group of resins that reduce absorption of dietary fats that lead to high cholesterol. When steamed, they’re at their potent best. The very same resins which help to battle those dreadful carcinogens massing in the body also combine with Vitamin C to buffer the stomach lining and purge harmful toxins from the body. In fact kale’s plethora of phytonutrients helps to create a defense against harmful bacteria building up in the stomach. What results is a steady purge of bad elements from the body. And when those amazing phytonutrients infuse into the bloodstream, they help to build a strong defense in the circulatory system, funnelling powerful toxin-fighting agents to each of the organs. Weekend warrior or gridiron giant? Then you’ve racked up your share of sports injuries. Even if you’re not an athlete you’ve probably felt the wear and tear of the elements on your body at some point or another. That swelling that came from any of those experiences is inflammation. 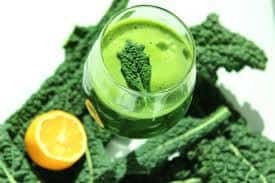 Thankfully kale is teeming with anti-inflammatory flavonoids and nutrients which help to reduce inflammation or even stop it dead in its tracks. Even in small servings, this combination of more than 45 powerful flavonoids, multiple vitamins and nutrients goes a long way to give anti-inflammatory healing a boost. Kale really is the superfood it claims to be. Imagine eating less than 100 calories of kale and getting 350 mgs of Omega 3 fatty acids. No shady hard to swallow capsules involved. In fact a meal of kale will boost your intake of Omega 3s exponentially. The surprising thing is when nutritionists talk about getting our recommended daily allowance of Omega 3s the conversation usually revolves around fish. Fish can be expensive and heavy on the stomach. Neither is true for kale. Kale is inexpensive and very light at only 36 calories per 130 grams. Kale helps flush the bloodstream with powerful phytonutrients. These phytonutrients which aid in fighting cancer, inflammation and pulmonary diseases are also rich in nutrients that aid in your heart, lungs and circulatory system’s performance. Vitamins like C and K are instrumental in keeping our tickers running at full speed. And kale is rich in both. And the antioxidants and glucosinolates are equally important for ridding the bloodstream of dangerous toxins. Kale is high in a multitude of health benefits. Add fiber to that list. Fiber for all its wonderful qualities helps to keep our digestive system at its best and our elimination of waste from our bodies consistent. Kale has excellent percentages of fiber at 2.6 g of fiber per cup of kale. Perhaps some of the best nutritional bang for your buck you can find around. Per 130 grams of kale you’ll find 10.4% of fiber included. Very few products at the grocer provide the nutritional value kale boasts. If kale had more protein and some fat, you could live off it for the rest of your life. Just take a look at all these essential vitamins and minerals that you can find in a mere 130g (1 cup) of kale. For 36 calories kale provides 53.3 mg of Vitamin C, 1062 mcg of Vitamin K, 2.6 g of fiber, 0.13 g of Omega 3 fatty acids, 0.2 mg of copper, 0.54 mg of manganese and 1.17 mg of iron to name a few. How many other foods can say that? Very few. And 130 g of kale is only 36 calories. One cup of kale is only 36 calories and 0 grams of fat. It also provides 20% of the RDA of dietary fiber which in all its digestive glory promotes regular digestion, prevents constipation and lowers blood sugar levels. The glucosinolates also prevent the bacteria H. pylori from forming on the stomach lining and leading to gastric cancer. Kale is teaming with a powerful cocktail of B Complex, K, C and A vitamins. Plus kale is equally an excellent source of manganese, copper, and iron. 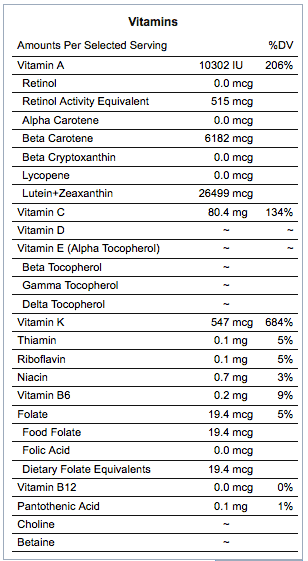 Vitamin K at 1327% in one cup of kale is necessary for the synthesis of protein. Vitamin A with over 192% of the RDA in a cup of kale is great for boosting immunity, healthy bones and the reproductive system. And vitamin C is a powerful antioxidant and immunity booster. Calcium is one of the essential building blocks for healthy teeth and bones. And kale is an excellent source of it. 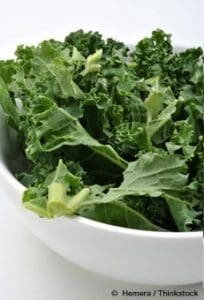 One cup of kale provides 94 mg of calcium. For lactose intolerant people, kale is another great source of calcium and a great alternative to dairy products. Preheat your oven to 350 F for 10 minutes. Wash kale thoroughly. Cut leaves and stems into 1/2 inch and 1/4 inch pieces respectively. Line a cooking sheet with paper. Season kale with salt and pepper and coat with olive oil. Bake for 15 minutes maximum until edges have browned. 1. Heat olive oil over a medium setting. Slowly add pepper, onions and garlic. 2. Add vegetable stock, beans and stir. 3. Add kale and cook for about 15 minutes. 2. Add to a juice and juice. Kale truly is a superfood. 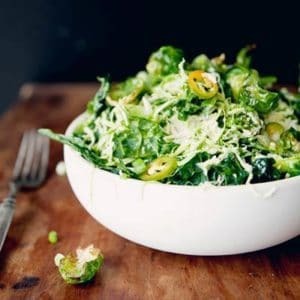 You’ll find that even with these simple recipes your palette will thank for bursting flavors, your body will reward you with more dynamic performance, and your health will take leaps and bounds forward for the positive. And if nothing else is incentive, kale is an inexpensive food shopping choice.